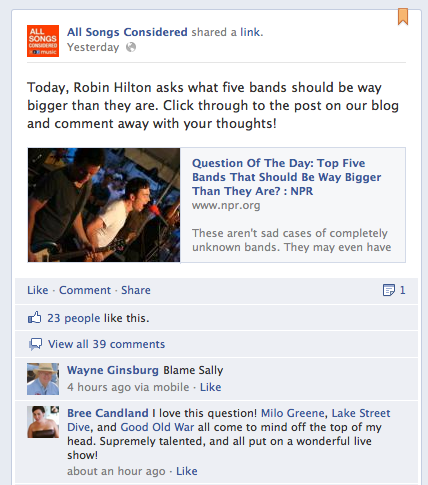 Robin Hilton from All Songs Considered on NPR Music asked a few days ago on their Facebook page, “Question Of The Day: Top Five Bands That Should Be Way Bigger Than They Are?” I added Lake Street Dive to their growing list of artists who should definitely already be famous. 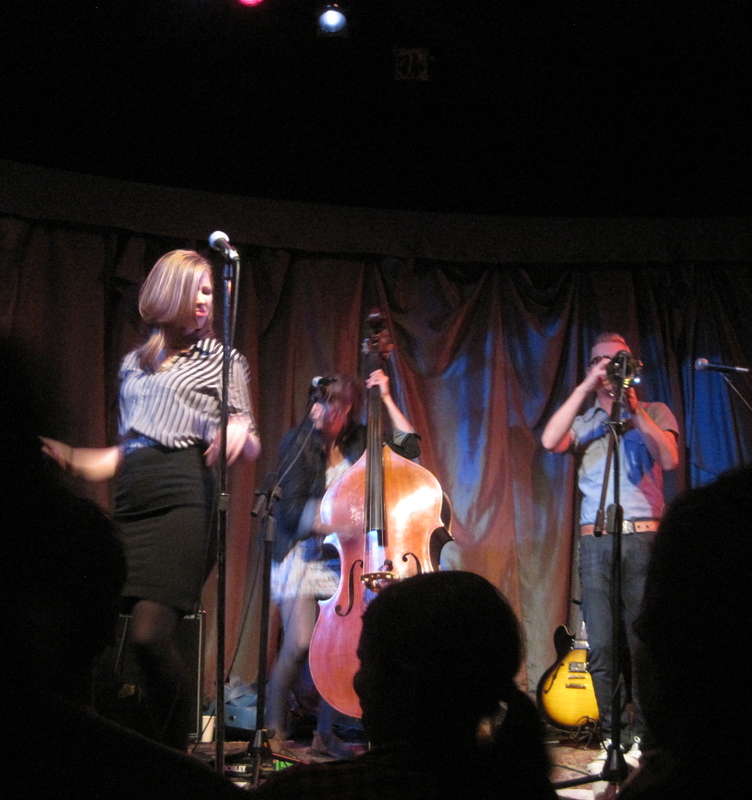 Tom Rota from One Longfellow Square and I have been in touch from time to time for years about acts I’d like to see come to Portland, and he mentioned about a year ago that I wouldn’t want to miss Lake Street Dive. I am so glad that I listened to him and made my way to OLS to see them last December. I was blown away by their talent—Rachael’s vocals are nearly unmatched in the music biz today, the harmonies were tight, the songs were playful and catchy with jazz influence, and they interacted comfortably with each other and the audience. It was a phenomenal show. I was really excited when I saw they were coming back to One Longfellow Square—even if it meant that my concert calendar got packed with four shows in four consecutive days. I had a leisurely and much needed girls’ dinner at The Merry Table with my friends Courtney and Sophie before the show. I was so happy to have time to catch up with them that I didn’t even rush out to catch the opening act. Courtney dropped me off outside OLS instead and I struggled to find a spot in the packed house, but managed to find a seat in the third row. It was a sold out show for LSD (I realize LSD is also a drug, but in this post I’m referring to the band)! I’m glad that the word is out! I only caught the last two songs that Laura Cortese played. 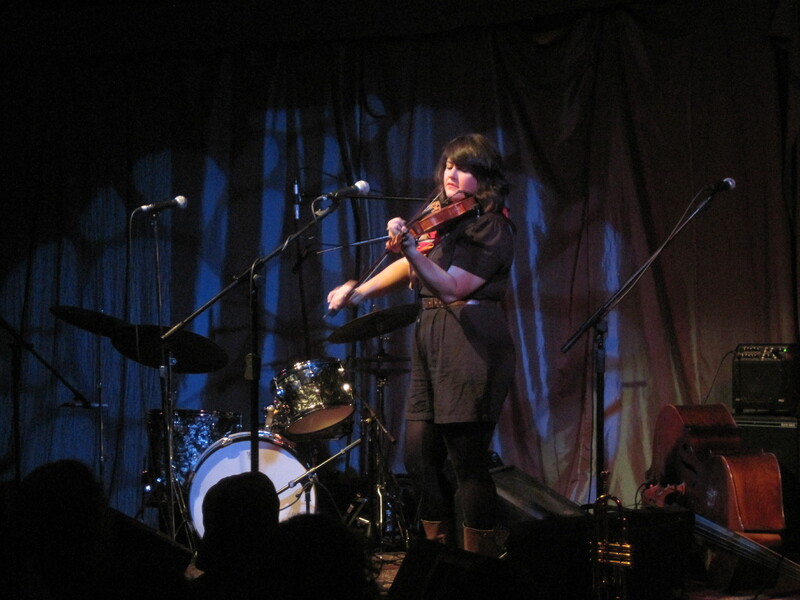 She was solo on fiddle (can stomping in your cool boots count as percussion, though?) and had a folky vibe. 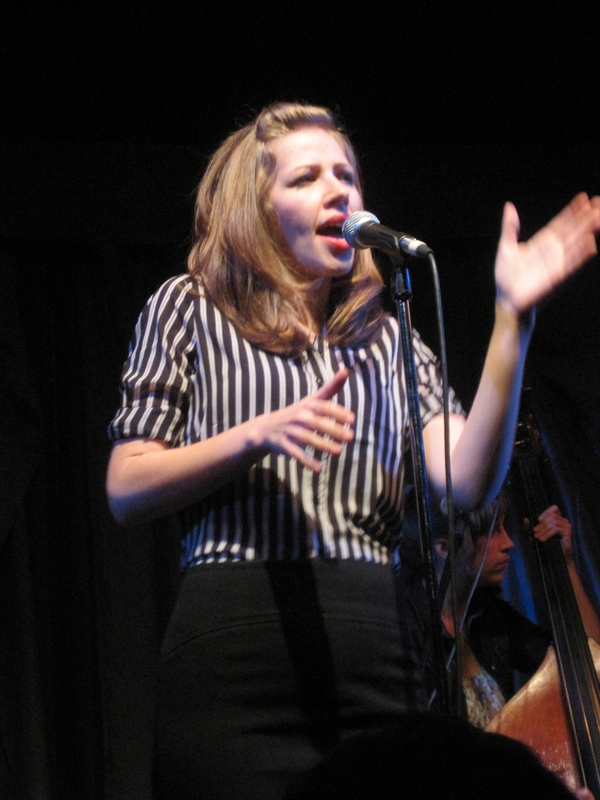 Lake Street Dive took the stage after a short break. They are crazy talented. 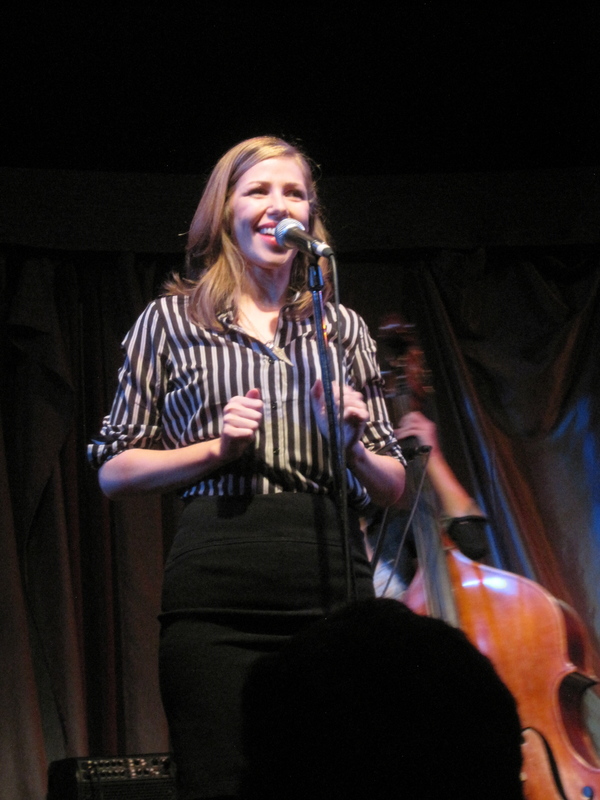 Rachael Price, Mike Calabrese, Bridget Kearney, and Mike Olson met years ago as classmates at Boston’s New England Conservatory and have been together for a few years. I’ve listened to Lake Street Dive many times during my morning commute to get my energy up for my kiddos. It’s so good and does the trick. They opened with “You Go Down Smooth” and then played a song about drummer Mike Calabrese’s feelings, “Miss Disregard.” The opening of the song is cheeky—“I’m done with you/I’m totally done with you/I’m completely and utterly done with you.” Sometimes we wish, right? Love Rachael’s face in this one! Try getting a picture of Bridget who is constantly in motion! There’s Mike Olson, too. As a single girl, I LOVED and completely appreciated their song with the lyric “If you’re married, wear a wedding band!” There was a lot of laughing in the crowd during that one. They played another of drummer Mike’s songs (“What About Me?”) that Rachael told us he’s written “from a woman’s perspective.” Apparently he does that from time to time. I think he’s pretty observant, actually! 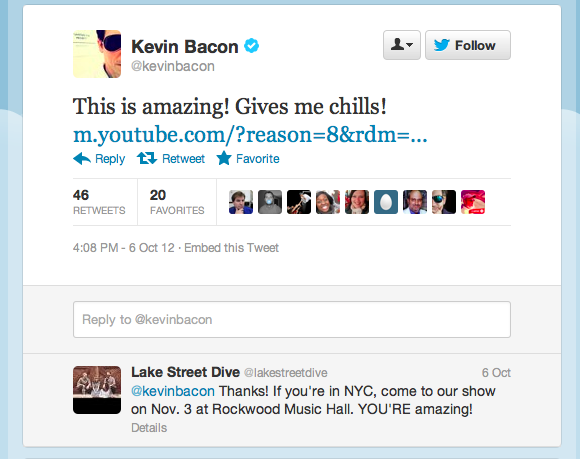 Kevin Bacon has recently helped spread the word about the fabulousness of Lake Street Dive. He tweeted a link to their video for “I Want You Back” with the comment “This is amazing! Gives me chills!” You can’t pay for better advertising! The video has gotten over 350,000 hits in the last two weeks alone. Rachael said that Ryan Seacrest tweeted about them after that as well. They played it for us and then we had a little intermission. I turned around and met a bunch of great people who’d driven from Fryeburg for the show. They were great to talk to and were really interested in music and the concerts I’ve seen. One degree from Kevin Bacon?! Impressive! After the break, LSD opened their second set with a song by their guitarist/trumpeter Mike Olson about “an unfortunate woman” that featured Bridget with a KILLER bass solo. Woah. I loved their cover of “Faith,” and “Neighbor Song” was up next. It’s one of my favorite LSD songs, and I love the lyrics “In this city all the humans live in layers/I got people down the hall and down the stairs/We all move in and out and live our lives in stacks and rows and pairs/And try to ﬁnd someone with whom we can share it.” You know those black and white movies of women in uniform singing songs like “Boogie Woogie Bugle Boy” in clubs during WWII? I can picture this band there so easily. They have a timelessness about them that makes it easy for a diverse audience to relate to them. I like “Don’t Make Me Hold Your Hand” a lot, and enjoyed another song drummer Mike wrote from a female perspective about having a crush on a guy in a band. He can really sing, by the way. Everyone in LSD can, for that matter, and their harmonies are spot on. There was less storytelling at this show than at the last one, but they barely took a pause between songs and really packed in the music. Rachael acknowledged the lack of banter and said she was at her “quota of awkward.” I liked Mike O’s new song “Use Me Up”—and the new songs they played made me look forward to hearing the album they’re recording right now. I love this shot! I had to get up and walk to the back of the room to fit all of LSD into one frame. They wrapped up their set with one of my favorites, “Hello? Goodbye!” I think it’s easy to relate—“I should tell my mind to stop remembering/I should make my fingers stop their trembling/And when I pass your doorway I should just walk right by/When you say hello, I’ll say goodbye.” LSD was kind to us and seemed sincerely grateful we’d come out. We stomped and cheered for an encore and they obliged with “Got Me Fooled.” Drummer Mike joked that we should sing along because it’s a song about Rachael’s feelings and singing it makes her feel vulnerable. 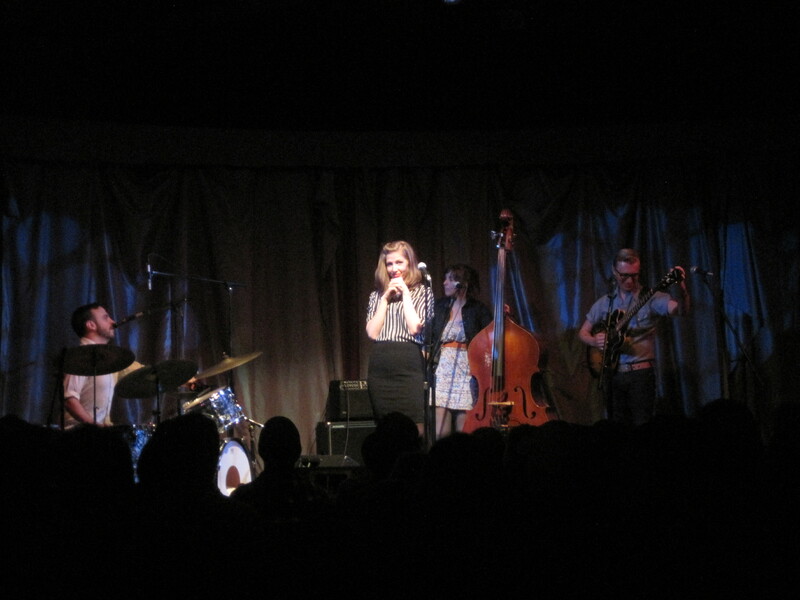 I don’t think many people did sing along—Lake Street Dive is so good that I didn’t want to interfere with their impeccable sound. Another great LSD show! If they’re in your neck of the woods, do yourself a favor and get out to see them!